This is a static shooter heavily inspired by Geometry Wars, featuring several grids, powerups, difficulty levels, high scores, and enemies. There is only one mode, where the player loses if there are no lives left and the high-score is then recorded in the hall of fame. The score is raised by eliminating enemies by shooting, which weakens or destroys them, or with a bomb which wipes out all opposition in the scenario. Enemies range from a black hole, absorbing everything near it through a force field, to snakes that can only be taken down if the head is hit. Some enemies have shields, others evade your shots, some even create multiple enemies when they are hit, and there are many others. Power-ups include: new life, bomb, lateral shots, shots that bounce off the limits of the scenario, another cannon, a temporary shield, etc. Gameplay consists of moving, shooting cannons and using bombs, mouse input being used for all of these. It was made with Blitz Basic. 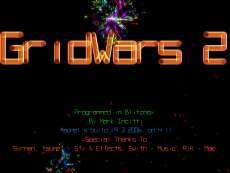 It eventually became so popular that Bizarre, the creator of Geometry Wars, emailed Incitti and asked him to take the game down, citing that they were "beginning to feel the Geometry Wars clone's effects on our sales via Microsoft now and are beginning a process to begin to more robustly protect our copyright and intellectual property".